In Brief: Repatha Pushtronex - A New Evolocumab Injection Device | The Medical Letter, Inc. The PCSK9 inhibitor evolocumab (Repatha – Amgen) is now available in a single-dose, hands-free device (Repatha Pushtronex) for once-monthly subcutaneous infusion. 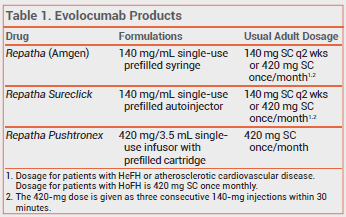 Evolocumab is FDA-approved as an adjunct to diet and maximally tolerated statin therapy for patients with heterozygous familial hypercholesterolemia (HeFH) or clinical atherosclerotic cardiovascular disease who require additional lowering of low-density lipoprotein cholesterol (LDL-C), and as an adjunct to diet and other LDL-lowering therapies for patients with homozygous familial hypercholesterolemia (HoFH). Evolocumab is also available in 140-mg single-use prefilled syringes and autoinjectors (Repatha Sureclick).1 Use of these formulations to administer the once-monthly dose (420 mg) requires patients to inject themselves three consecutive times within 30 minutes. Another PCSK9 inhibitor, alirocumab (Praluent), is injected every 2 weeks; it is available in single-dose prefilled syringes and pens. Approximate WAC for one 420-mg dose. WAC = wholesaler acquisition cost or manufacturer's published price to wholesalers; WAC represents a published catalogue or list price and may not represent an actual transactional price. Source: AnalySource® Monthly. August 5, 2016. Reprinted with permission by First Databank, Inc. All rights reserved. ©2016. www.fdbhealth.com/policies/drug-pricing-policy.